Berlin Community Daycare moved to our current location in November 1993 from our previous address on Huron Street. The center is centrally located in the city of Berlin at 107 West Moore Street, so it’s likely not far from your home or work. Our facility formerly housed the Saint Stan’s Catholic Elementary School, providing an appropriate layout for child care as well as a bit of nostalgia for many of our parents! With safety being our top priority, we have recently equipped our 9,000 square foot facility with a state of the art security system. We encourage you to call us to make an appointment for a full tour of the center to see first hand what a great place BCDC is for your little one! “Why the silly names?” you might be asking. Children are much more responsive to names and descriptions than they are to a number. When a 3-yearold gets to move to the Sunshine Room they are much more excited and receptive to the change than if they were told they were moving to the 3-year-old Room or Room 3. Basically, each and every decision we make is to ensure that the child care experience is fun and effective, right down to the names of our classrooms! Click on one of our classrooms listed below to view our center! Welcome to the Little Stars Room! This spacious room allows for children to have their own quiet space in a crib or pack n’ play to allow for quiet slumber. Ms. Jenni and Ms. Savannah do a wonderful job of tracking baby’s day in detail for parent’s reference each evening. They are also happy to help support your baby’s already established schedule or aid in forming a daily schedule for your little bundle. Babies enjoy age appropriate toys and activities that are rotated frequently to keep them discovering. Lots of one on one interaction, music and exploration are part of each day. Welcome to the Milky Way Room! In the Milky Way Room it’s all about rolling over and crawling, cooing and learning the basics of communication in this stimulating environment. Lots of learning goes on at this stage of development and the teachers, equipment, and toys in the Milky Way Room will help your child explore and learn about the ever growing world around them. Ms. Shanna’s calm and compassionate personality allows the toddlers to explore and grow individually while still feeling safe, secure and loved. Welcome to the Galaxy Room! In the Galaxy Room it’s all about turning waddling into walking and cooing into conversation in this stimulating environment. Lots of learning goes on at this stage of development and the teachers, equipment and toys in the Galaxy Room will help your child explore and learn about the ever growing world around them. Ms. Gina’s calm and gentle personality allows the toddlers to explore and grow individually while still feeling safe, secure and loved. Welcome to the Moonlight Room! Whoever said the two’s are so terrible? We think being two is a great time of discovery and growth! Many children this age are growing more independent. This new found sense of self is nurtured with learning centers, such as dramatic play, art, science and more. Ms. Lisa takes great steps to help foster her students’ independence and growth while continuing to provide a stable, compassionate relationship. Yes, sometimes two year olds can be temperamental, timid or tricky but never terrible! You can find the three year olds playing and learning in the Sunshine Room. Ms. Jess has created a wonderland of discovery, creativity and imagination. Children enjoy daily circle time that prepares them for preschool and four year old kindergarten. Children begin letter recognition activities, work on pre-writing skills and learn about to interact and share with other children. Ms. Jess plans a uniquely fun lesson plan for each and every day, filled with art projects, games and more! Welcome to the Twilight Room! In Preschool, the four year olds learn all about what it’s like to be in “big kid school”. They prepare for Kindergarten by learning to write their own names, raise their hands, take turns and other essentials. 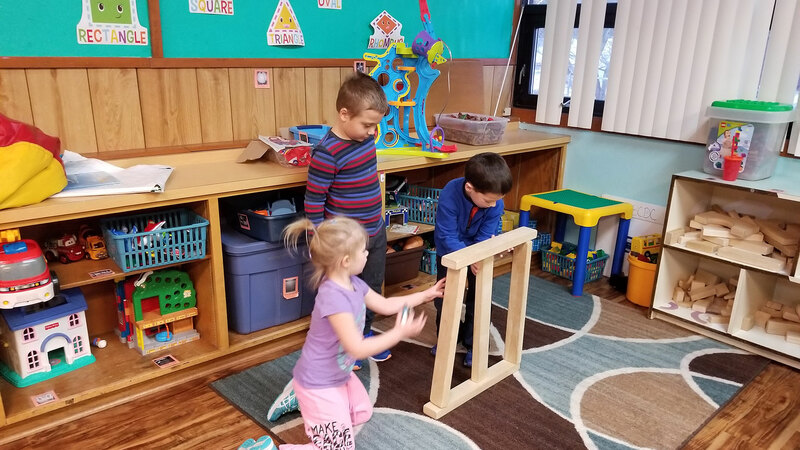 Children explore with their friends in learning centers designed to allow children to learn in a style that suites them best and at their own pace. Ms. Lauren enthusiastically welcomes each child to her circle time carpet each morning and has an abundance of new opportunities and activities for the children each day. They learn about math, science, writing and pre-reading skills, Spanish and much more as each subject relates to the weekly theme. Welcome to the Comets Room! The Comets Room serves two purposes. It houses two sessions of the Four Year Old Kindergarten program through the Berlin Area School District from September to June and then transforms into our Summer Fun program while school is out. We began offering 4K through our partnership with the Berlin Area School District in 2010. BCDC is proud to offer the young residents of Berlin an opprotunity to attend 4 Year Old Kindergarten. 2 sessions each day are available, one in the morning and one in the afternoon. Wrap around care is available for children who attend or parents can have their child bussed to and from school. To enroll your child in Four Year Old Kindergarten please contact the Berlin Area School District. We have so much fun each summer with our school aged friends! Kids up to age 12 can join the fun while you rest assured that you child is under full supervision in a safe environment. Kids do enjoy daily lessons that keep them fresh for next school year but most of the day is filled with free play and extra special teacher lead activities. Weekly cooking classes, daily art projects, wheels days where kids bring in their bikes and twice weekly water days for splashing on hot summer days keep kids engaged. Kids also go on walking trips to the Berlin Public Library and local parks for picnics or to play! Each year we plan a trip to the Green Lake County Fair in August, a greatly anticipated summer event. At Berlin Community Daycare & Preschool we know how important early physical activity and nutrution awareness are very important. Each classroom ventures outside to the playgrounds, weather permitting, for at least 1 hour each day. Kids engage in teacher lead activities like duck-duck-goose, bubbles or hula hooping and enjoy our beautiful new playground equipment. Our 9,000 square foor playground is separated into two play spaces so that our equipment is age appropriate. We hope that the shady, grassy spots, sand piles and free open spaces to run, skip and dance will inspire children to love playing outdoors here and at home.